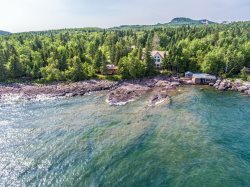 On a beautiful stretch of Lake Superior shoreline. View of cabin from the shores of Lake Superior. Cozy cabin nestled in the woods of the North Shore. Beautiful lawn to enjoy and soak up the summer sun while enjoying an amazing view. Relax and watch a movie here in this living area. Open space makes it comfortable for everyone. Inside the cabin has an authentic rustic feel. Bright space inside and out. Fully equipped kitchen with gas stove. Plenty of cupboard space to store your supplies. Enjoy your morning coffee with this view. Get a good nights sleep on this full size bed. Plenty of space to unpack and enjoy your stay. Twin beds allow space for extra guests. Get a good nights sleep after a day of hiking on the Superior Hiking trail. Full size bath stocked with linens. Enjoy that favorite meal at this picnic area. This beach provides the best of the North Shore. Unending view of Lake Superior. Small stairway down to the beach. Rock picking at its finest. What a view. Perfect spot for kayaking along this shoreline. Located right at water's edge in Schroeder. Cute and quaint are two words that can describe Superior Reflections 1, but this cabin offers so much more just outside your front door! Enjoy a stroll down the cobblestone beach, shared amongst the other Superior Reflections Cabins, but offering a lot of privacy. There are many beautiful reflections from the lake, sun, clouds, moon, and stars at this darling little cabin. Here you are just a short drive away from many area attractions. Temperance River State Park is practically in your back yard with miles of hiking trails and beautiful waterfalls. Also, nearby you will find mountain biking trails, scenic overlooks, and much, much more! Hungry for a bite to eat? Hop in the car and head up the shore and check out some of the great resort restaurants in Lutsen, including the Bluefin Grille at Bluefin Bay, Lakeside Dining Room and Poplar River Pub at Lutsen Resort, Moguls Grille & Tap Room at Caribou Highlands Resort, and Papa Charlie's Grill & Tavern at Eagle Ridge Resort. Each features live music from popular local artists throughout the summer. The cabin was just perfect. It was clean, location was wonderful. The only suggestion would be add a full length mirror in one of the bedrooms. Location was perfect. Quiet, yet centrally located to all sights we checked out. The cottage is clean and well maintained. The beach is relaxing, private and lots of great rock hunting! Check in and check out was easy as we did not have to make the drive to the rental office. We loved the cabin, Superior Reflections 1. Would have appreciated a notice about the water. A bear or racoon got into the garbage can of previous occupant, so we took our garbage with us.We had trouble finding the Cascade Rental office, thinking it was still in Tofte. We had a wonderful time! It was amazing to have the beach all to ourselves! We have stayed at the north shore previously and we were never alone on the beach wherever we went. So being alone was worth everything! It was so quiet, no noise but the waves and birds. The cabin was just right very cozy and bright! We made all or meals on this trip and it was so nice to have dinner every night with a spectacular view! The view was fabulous!!! The beach was the best! We listened to the waves crashing on the rocks all night!! I LOVED the knotty pine!!! It was very clean and so comfortable!! We enjoyed every minute we were there!!! The lady who checked us in gave us a road trip to take thru the hills and the colors were amazing!!! The only hitch was the name of the road back down was changed so our ride was longer than we anticapated but it sure was pretty!! We did make it back down before dark:) I would recommend this place to everybody I know!!! We are already looking forward to next year!! Thank you for a wonderful weekend!!! The 4 of us always have a good time - there is nothing we don't like. Superior Reflections 1 is a beautiful cabin, old fashioned from the outside, but lovingly restored on the inside. We like it best of all the cabins we have rented through Cascade. There was nothing to dislike. Our dogs also loved it. Easy access to the shore was great. Thanks to the owners for their lovely cabin.